Normally I won't even take my 3 to a soft play centre in the school holidays for fear of it being too busy! 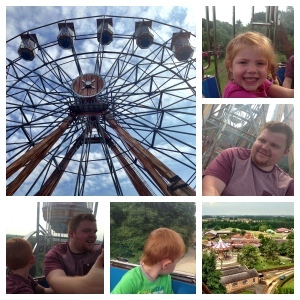 The thought of taking a 2 year old, 4 year old and 6 year old to a theme park in August just filled me with dread! I had visions of queuing for hours, crowds of people and miles of walking/whining children. However, I really could not have been more wrong! 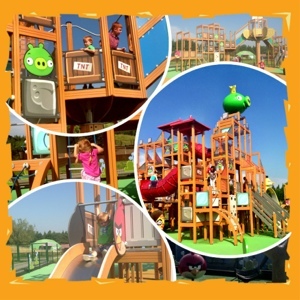 When we were invited to visit lightwater valley and check out their new angry birds play zone, I was very pleasantly surprised! Lightwater valley is closer than you think. From our house in South East Northumberland it only took 1hr 20 mins in the car. 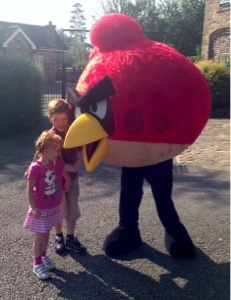 Car parking is free and there were no queues at the ticket booths and we were greeted by an angry bird! A great start! 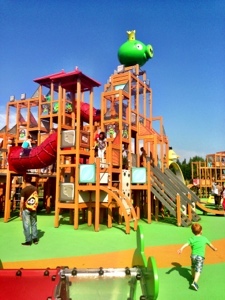 The kids wanted to try out the angry birds zone first of all and conveniently it is located right by the entrance. I was very impressed with this area - lots going on for all ages. Giant touch screen computer games on the walls, counting games on the floor compete with talking angry birds, TNT climbing frames and every type of play equipment you can imagine with fantastic theming throughout (even the bins were angry bird themed). The kids had an absolute whale of a time and could have spent hours here. 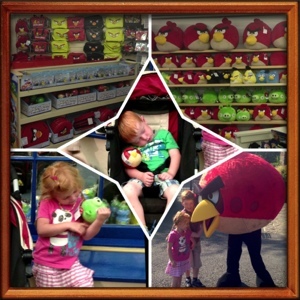 If they hadn't have spotted the indoor angry birds play zone, I would have had trouble dragging them away! 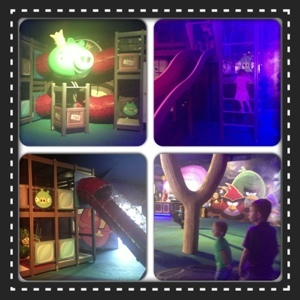 The indoor part of the angry birds zone is space themed, in darkness and lit up with UV lights. My 2 year old was screaming and jumping with excitement. I think it's the happiest I've ever seen him! There is a small cafe inside too to grab a cuppa while the kids play. After we spent about an hour in Angry bird land it was time to try out some rides. My daughter was disappointed she was just too little to ride the carousel however soon cheered up when we found some more suitable rides next door. I was amazed that this was August and there was absolutely no queuing for anything! 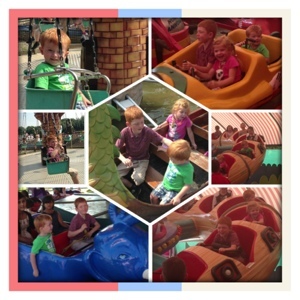 I liked the fact that little ones could go on rides either with or without a grown up. After trying out some rides we decided to take the train around the park. This is a good way to get your bearings. The park is really compact (which is why I didn't once hear the kids moan they were tired) and the train ride took about 15 mins. There were places to leave pushchairs at the station and it was lovely to be able to all enjoy some rides together. We had spied the big wheel from our train ride so that was our next stop - again I was really pleased that we could all get on the ride together. The views over the park were spectacular. We would normally take a picnic on a day trip like today however I just hadn't got round to making one! (Plus our cupboards were bare after bank holiday weekend). Plenty of people had took a picnic though and there were lots of picnic areas around the park. It is definitely what I would recommend. We decided to try the conservatory restaurant. Prices were what you would expect from a theme park. There were long queues to be served though :-( Very strange that there were no queues for rides but there were for food I thought! Anyway, when our food arrived it was delicious and £25 for 5 meals including drinks certainly wasn't as bad as it could have been! After our re-fuel we enjoyed more rides (especially in the pirate themed area). I was really pleased with the selection of rides available for younger guests to enjoy. 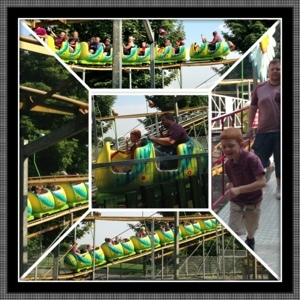 The kids were eager to try out a roller coaster so we headed over to the caterpillar which can be enjoyed by all ages. Everybody loved it, especially daddy! Then in was nice to chill out for 10 minutes while the kids played in the sandpit. 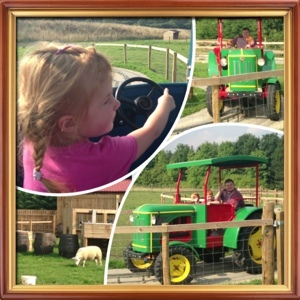 My 2 year old LOVES tractors so we were really pleased to find that you could drive your own tractor around a real life farm. I was really keen for us to get as much value out of our day as possible so we decided to watch the birds of prey show at 4pm. 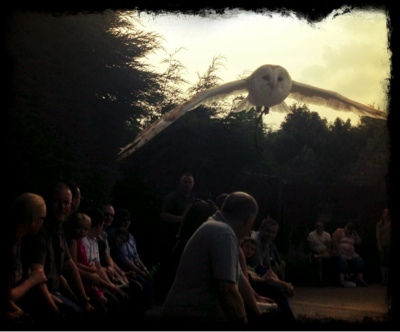 You can walk around and admire the many birds at anytime and the shows are on twice a day. 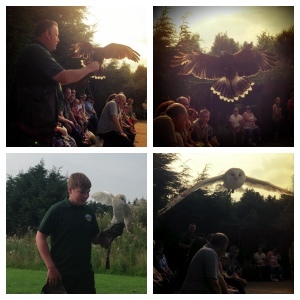 The bird handler was very knowledgable and engaging however the birds were the star of the show. They were spectacular! 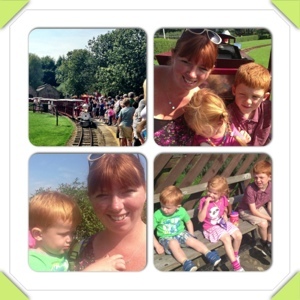 I am so pleased we paid lightwater valley a visit. It was a fantastic stress-free way to end the summer holidays and nothing at all what I expected visiting a theme park with young children to be like. On the way out we were offered vouchers to visit again in September/October/November for only £12 each which is something we definitely plan on doing. We all can't wait to visit again.